I know now that it was the summer of 1965 when it all changed. As a matter of fact, I can point to the one exact panel that, I believe, truly began the five-year reign of Stan “the Man” Lee and Jack “King” Kirby as unchallenged champions of the superhero comic world. But let me back up a bit. For the last year or so, I’ve been reading my way through as much of Marvel Comics’ 1960s output as I can, and last summer I criticized the clunky dialogue and brute-force plotting that seemed to be the hallmarks of Lee and Kirby in the early days of Fantastic Four and The X-Men. But I kept on reading… and then something wonderful happened in those old pages: they got good. And even better, they got really, really enjoyable. So let me give you my mea culpa, and explain how I learned to stop worrying and love the Marvel Age. 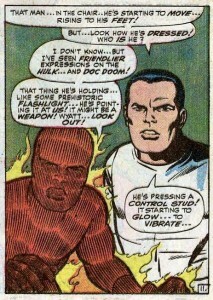 The watershed moment came in Fantastic Four Annual #3, published in the summer of 1965. Along with a couple reprints, that annual featured the long-awaited wedding of Reed “Mr. Fantastic” Richards and Susan “Invisible Girl” Storm, while their long-time foe Doctor Doom decides to ruin the wedding by coercing all the superteam’s foes—the Puppet Master, the Red Ghost and his apes, the Mole Man and his subterranean minions, and others—to attack the wedding all at the same time. As it begins this story is very much of a piece with what the Fantastic Four had become by mid-1965: a story focusing on the team’s media celebrity, interpersonal drama (the hallmark of the more “realistic” Marvel style), and villains who, for all their bizarre superpowers, amount to little more than petty criminals or Communist provocateurs. It wasn’t a bad product, and over the 43 monthly issues and two annuals that preceded this one I had grown to enjoy reading it on its own merits. Especially after I got to read some of their competition’s product from that era, Stan Lee’s ability to give his main characters distinctive voices and points of view is worthy of much praise. Turn out the lights, metaphorically speaking, and even in the dark you could tell Reed’s speech from Ben’s or Johnny’s, and if his Sue Storm was a cringeworthy artifact of a much more sexist time, she definitely had her moments too. 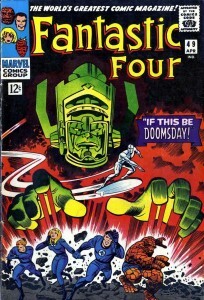 So credit where credit is due: by mid-1965, Marvel’s comics in general, and Fantastic Four in particular, had earned its reputation as groundbreaking work that set itself apart from its contemporaries. And then, on page 21 of that 1965 Annual, the future appeared. The mysterious Watcher (a bald alien giant who had helped the FF on a couple of occasions despite his supposed pledge never to interfere in the affairs of lesser races) whisks Reed away from the melée at the wedding and transports him to his faraway “home”, where he offers Reed the use of one of his alien devices to defeat the supervillain threat and save his wedding day. 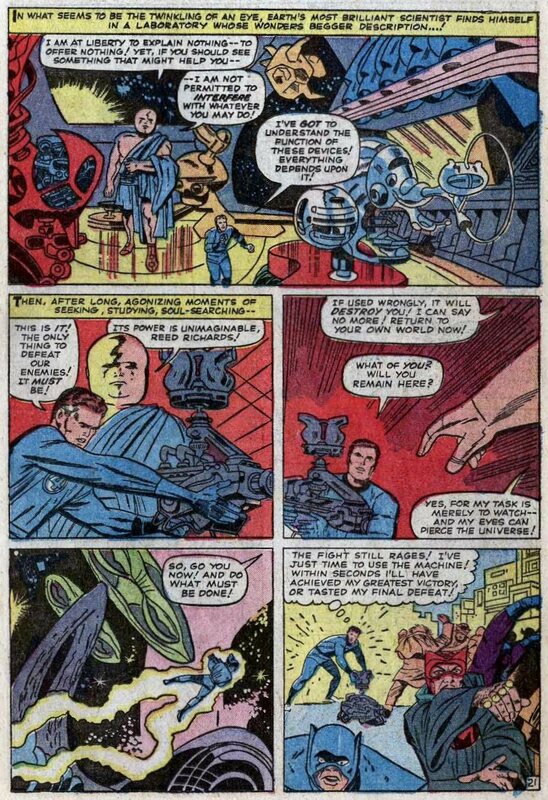 There, Kirby and inker Vince Colletta give us something altogether new—the first real view of the vast, baroque machinery and cosmic spaceways that would, more than any other element, become the signature imagery of Kirby at the peak of his creative powers. That was but a glimpse, a mere four panels (Reed returns to the Baxter Building in the page’s last panel). 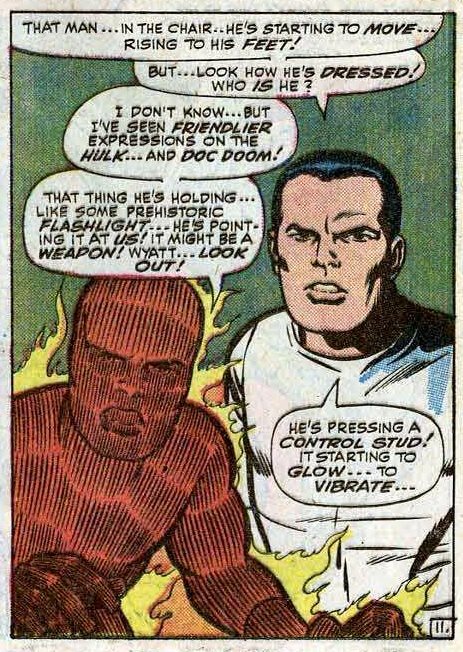 But, perhaps not coincidentally, the very next issue of Fantastic Four to appear before the public (#44, cover dated November 1965) was the first in which inker Joe Sinnott joined Lee and Kirby. The team of Lee, Kirby and Sinnott would be unchanged for the next 49 issues. Sinnott’s muscular, rock-solid inks gave a weight to Kirby’s art that brought it to a whole new level. 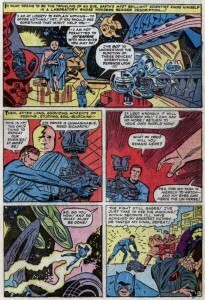 I don’t think it’s an accident that shortly after Sinnott came on board, Fantastic Four introduced the world to a veritable parade of iconic characters and concepts: Galactus, the Silver Surfer, the Inhumans, the Black Panther, the Kree, the Negative Zone, and Annhilus all debuted under that unusually stable creative team. I was as shocked as anyone to realize that, even this many years later, it’s good stuff! I went into this ’60s-Marvel reading project as an intellectual exercise, a way to contextualize and learn more about the origins of the Marvel Universe. So when I got into these famous, classic issues and realized that I wasn’t just interested in ’em from a historical perspective, but was actively enjoying them in the way they were originally meant to be enjoyed, it was definitely the most pleasant of surprises. Let me be clear, even after this artistic watershed, many of the criticisms in my earlier column were still valid. The characters were still prone to shouting the obvious at each other (witness Stan gamely trying to compensate for what he clearly thinks is inadequate visual storytelling in the panel to the left). The much-vaunted interpersonal drama was often forced. For example, Johnny “Human Torch” Storm and the Inhuman named Crystal seem to know each other for all of fifteen minutes before declaring their undying love for each other, just as an impenetrable barrier separates them apparently forever. Johnny and Crystal spend the next year thinking of nothing but each other, with Johnny driven to all kinds of irrational behavior by his all-consuming passion. That’s the kind of thing I mean by “brute-force storytelling”. Also, Stan Lee still displayed an astounding ability to reduce any scientific concept imaginable—magnetism, thermodynamics, nuclear physics, gravity, soundwaves, you name it—to purest phlebotinum. 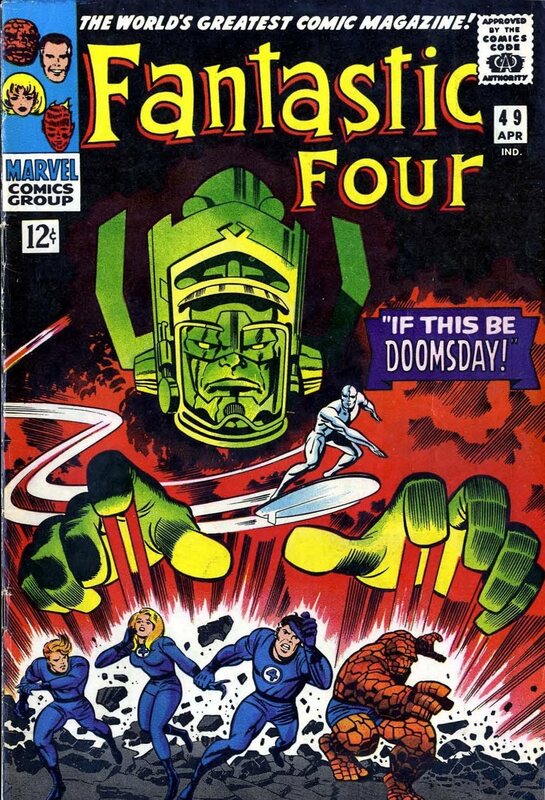 But somehow, either because of acclimation to the style or the weighty magnificence of Kirby’s art or just plain quality superhero fun, Fantastic Four became awesomely fun to read. And doubly pleasing is the fact that something very similar was going on at that same time in the pages of Journey into Mystery, which by mid-1965 had long-since jettisoned its sci-fi back-up stories to become a Thor solo comic book. For years, Stan and Jack had visibly tried to figure out what to do with Thor—at first they seemed content to have him beat up on jewel thieves, mobsters and Communists, but eventually it dawned on them that this was a god, and spent a couple of years throwing a succession of increasingly implausible phlebotinum-powered strongmen at him. All the while, they’d been running a back-up series in Journey called “Tales of Asgard,” in which they told short, rollicking tales of Thor, Odin and their fellow Asgardians in larger-than-life mythic adventures. 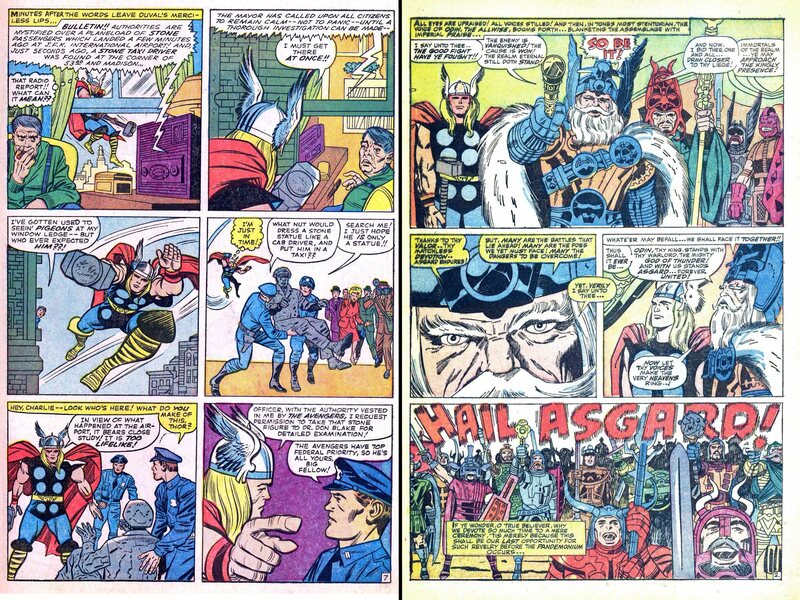 Those Asgardians had turned up occasionally in the main Thor feature, but generally as morons who were only there to swallow every lame, blatant lie supposed “master deceiver” Loki fed them in his endlessly unclever plots against Thor on Earth. Again, it was in the November 1965 issue (Journey into Mystery #121) that it all changed for the better. Another of Loki’s super-powered catspaws, the Absorbing Man, had apparently defeated Thor in hand-to-hand combat at the end of the previous issue. Feeling invincible as a result, Loki brings the Absorbing Man to Asgard, where he brawls his way into Odin’s throne room itself. This was the moment at which the truly larger-than-life mythological shenanigans of the “Tales of Asgard” are imported wholesale into the main Thor feature, and from here on out the book was simply amazing. 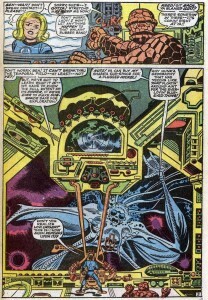 With more of the story taking place in Asgard or even—for a few issues—in outer space, Kirby’s art blossomed into imaginative magnificence to an even greater degree than in Fantastic Four. 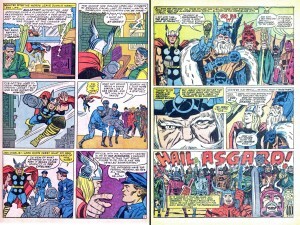 And I have to give especial kudos to Stan the Man for his work on this title; by the time Journey into Mystery was officially retitled Thor with issue #126 (March 1966), Thor and his Asgardian comrades spoke in grandiose, archaic dialogue loaded with “thou” and “enow”, and it worked perfectly. Seriously, it’s not easy to try to wield that kind of language without making a million mistakes or becoming unintentionally hilarious, but Stan got the grammar correct and managed to make it as dramatic and compelling as the more colloquial dialogue he was writing for the Fantastic Four and Spider-Man at that time. Again, Stan’s skills as a dialogue writer are worthy of much praise, despite its somewhat dated nature from our modern perspective. So that’s where I am. 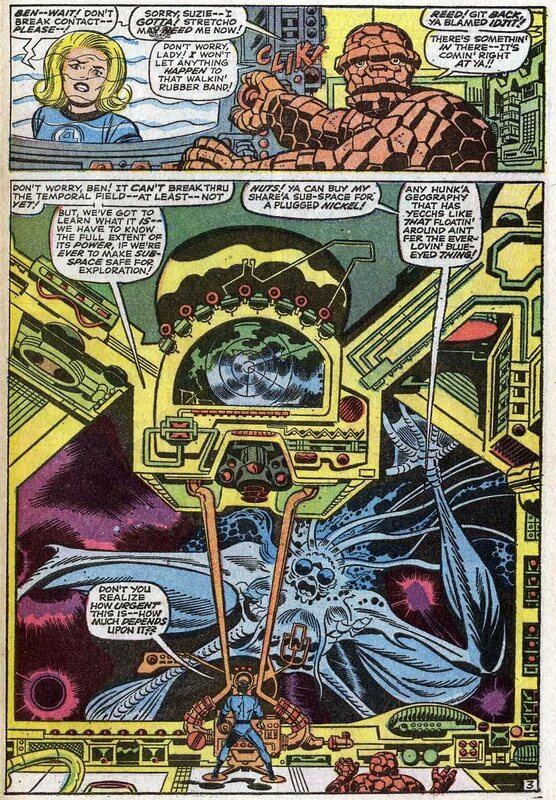 As I forge into 1967 in both Fantastic Four and Thor, both titles have acquired a narrative momentum which, coupled with the Kirby art in its fullest flower, is making me loath to put them down. Mea culpa, Stan and Jack; you really are the creative superheroes you’ve always been reputed to be. And when, sadly, I come to the end of their run on these two titles, I’ll still have their run on the first five years of Captain America to ease the Lee/Kirby withdrawal symptoms. An embarrassment of storytelling riches, indeed.